Ohio University junior Nathan Rourke (12) scrambles for a gain, during the Bobcats’ win over Howard on Sept. 1 in Athens, Ohio. NASHVILLE, Tenn. — Simply too big of a hole to climb out of. The Ohio football team trailed by as many as 28 points in the second quarter of Saturday’s non-conference clash with Virginia, and the Cavaliers held off the Bobcats for the 45-31 victory at Vanderbilt Stadium in the Volunteer State. Ohio (1-1) fumbled the ball away on its first possession and Jordan Ellis broke an 18-yard touchdown run on Virginia’s first offensive play. A.J. Mejia made his first of six successful extra-point kicks, giving the Cavs a 7-0 edge. OU went three-and-out on its next possession, and again Virginia needed just one play, as Olamide Zaccheaus hauled in an 86-yard scoring pass from Bryce Perkins. After a punt by each team, Ohio took possession for the fourth time at its own 20. On the third play of the drive, junior quarterback Nathan Rourke busted a 70-yard run, setting up a one-yard Maleek Irons touchdown two plays later. Louie Zervos added his first of four successful point-after kicks, cutting the Cavalier lead to 14-7 with 6:17 left in the first quarter. Virginia’s offense again just needed one play to score, as Ellis broke a 75-yard scoring run to extended the UVA lead to 21-7. Virginia added seven more points with 11:35 left in the half, as Ellis capped off an 11-play drive with a six-yard run. The Cavalier lead went to 35-7 with 2:52 to go in the first half, when Perkins found Hasise Dubois for a 10-yard scoring pass. OU went three-and-out on its next drive, but forced and recovered a Cavalier fumble to regain possession. Just one play later, Rourke connected with Papi White for a 29-yard scoring pass, cutting the Virginia lead to 35-14 with 1:27 left in the half. Ohio recovered an on-side kick and cut its deficit to 14 points, as Rourke found Isiah Cox for a 36-yard scoring pass with 50 seconds left in the half. However, Virginia was left with enough time to set up a 32-yard field goal by Mejia, and the Cavs took a 38-21 lead into the break. Ohio made it a 10-point game 5:33 into the second half, as Irons punched in from one-yard out, capping off a six-play, 80-yard drive, which featured a 37-yard pass to White and a 28-yard pass to Jerome Buckner. Virginia gained a little breathing room with 6:01 left in the game, as Zaccheaus caught a 77-yard scoring pass from Perkins. Ohio scored the final points of its 45-31 loss with 2:59 to play, when Zervos nailed a 45-yard field goal. Following the setback, Ohio head coach Frank Solich noted the up-hill battle his team put itself in. The Bobcats were outgained 552-to-364 in total offense, including 173-to-119 on the ground. Virginia had a 23-to-13 advantage in first downs, but lost the turnover battle by a 3-to-2 tally. Ohio was just 5-of-13 on third down conversions, while Virginia was 7-of-11. OU was penalized five times for 35 yards, while Virginia was sent back three times for a total of 20 yards. Solich also talked about the Bobcats’ finding their offensive rhythm at times. 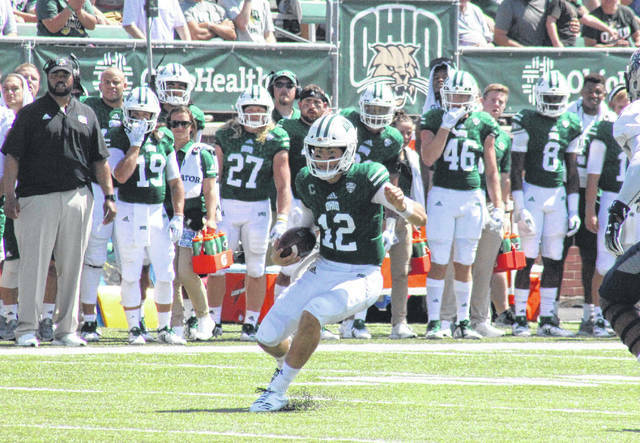 “I think offensively we showed that we have weapons, and that when we’re playing good football, those weapons get used and bring about explosive plays for our club,” said Solich. “It’s just frustrating to be playing that ball that we’re playing right now. We’ve just got to do a better job, some players got to do a better job, our team is playing hard. Rourke was 16-of-31 passing for 246 yards and two touchdowns, while carrying the ball five times for 41 yards. Irons caught one three-yard pass and led the Bobcats on the ground with 43 yards and two touchdowns, while A.J. Ouellette had two receptions for nine yards and added 34 yards on 14 carries. White led the Bobcat receiving unit with six receptions for 131 yards and a touchdown. Buckner had two catches for 44 yards, Cox caught one 36-yard touchdown, while Andrew Meyer had one 12-yard reception, and Cameron Odom had one seven-yard grab. DL Knock and Ryan Luehrman each had one catch for Ohio, gaining four and zero yards respectively. Ouellette, Cameron Gunnels and Eric Popp each recovered a fumble for the Bobcats, with Chukwudi Chukwu earning a forced fumble. Chukwu, Andrew Payne and Will Evans each had a sack for the Bobcats, with Evans earning a team-best two tackles for a loss. Jamal Hudson and Javon Hagan led the way with 10 and nine tackles respectively. For Virginia, Perkins was 25-of-30 passing for 379 yards and three touchdowns, while rushing 10 times for eight yards. Ellis led the Cavs with 171 yards and three touchdowns on 19 carries, while Zaccheaus had a game-best nine receptions for 247 yards and two scores. Virginia is now 2-0 in all-time meetings with the Green and White. The Bobcats return to their home state next, as they visit Cincinnati on Saturday at noon. https://www.mydailytribune.com/wp-content/uploads/sites/42/2018/09/web1_9.18-OU-Rourke.jpgOhio University junior Nathan Rourke (12) scrambles for a gain, during the Bobcats’ win over Howard on Sept. 1 in Athens, Ohio.